When I was a kid my dad’s nickname for me was Spill Queen. Aptly named, because I was a tiny disaster area who dropped things constantly. I was the most accident prone child–by the age of 6 I’d had almost 50 stitches, gained by doing everything from stepping on shark teeth to running through a glass door. Adolescence and adulthood didn’t prove much safer for me, as I punctured my foot with a stick, broke my ankle, and lost my teeth, among other things (though that one wasn’t my fault). But I’ve been on a pretty good run lately. Apart from very minor things, I haven’t had any injuries in quite some time. I was beginning to believe the guise that I had outgrown my clumsiness. How foolish. 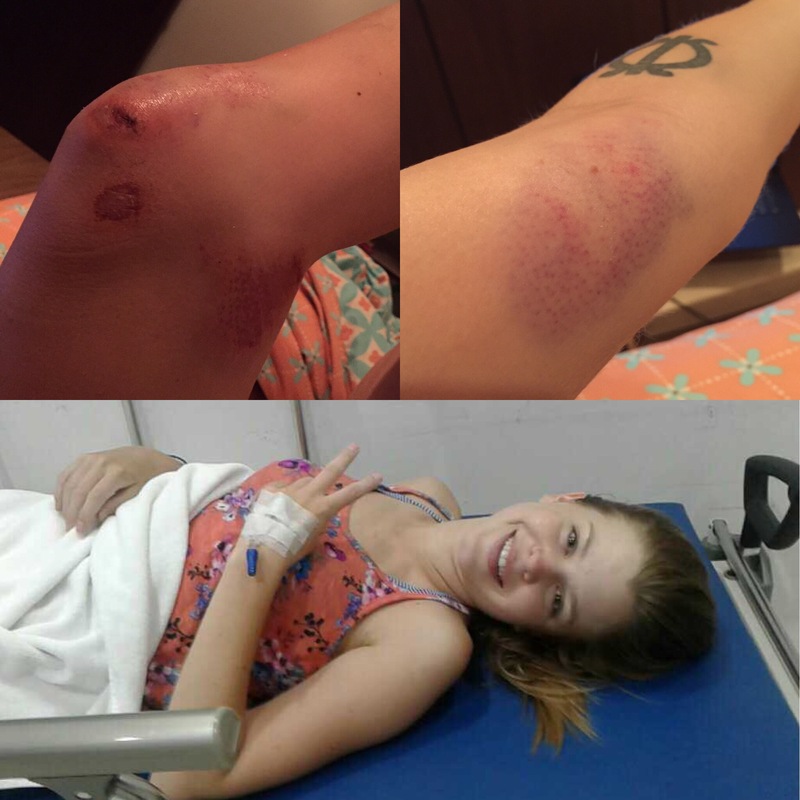 Last week while I was casually driving my scooter, as I have done every day for the last 4 months, I casually crashed and was thrown from my bike. After some nice people found me lying in the road looking dead, I was taken to the hospital in an ambulance, whining like a baby the whole time. The doctor actually told me his 4 year old daughter cries like me. Rude. Since the crash, which left me covered in bruises and cuts on my feet, legs, knees, hips, hands, and arms, I have proven myself to be the unbelievable klutz I was as a child. I’ve reopened my scrapes and worsened my bruises just by forgetting they were there and bumping them. I also fell down the stairs. Truly, it’s a miracle I’ve stayed alive this long. But the good news is that despite the terror of getting strapped into an ambulance by Thai men who don’t speak English and won’t tell you anything, and the aches and pains of a week of recovery, I’m doing just fine now. My injuries were all superficial and apart from some lingering cuts and bruises I’m just about feeling back to my normal self. Moral of the story: always wear your helmet. I did, and I’m not dead. So I’d call last week a success! IT COOLED DOWN. Briefly, but gloriously. This morning it was 75 when I awoke, and for the first time since moving into my 4th story room, I did not wake up covered in sweat. Had a housewarming party, and in attendance was my roommates cat Tyrone dressed in a dinosaur costume. What a dream. Bought an industrial sized fan and managed to drive it back on my scooter with my friend Phil during a thunderstorm at night. That was scary. But again, didn’t die. Ten points to us. That’s all for now. Things are good, life is lovely, and hopefully the heat is on its way out. Sorry to hear about your tiny accident 😦 but am glad it wasn’t too serious and you were wearing a helmet! Love reading your posts!